I have decided to start using paper diaries once more. I used to be so good at documenting and keeping track of appointments, my massage client bookings and general meetings with friends or colleagues. Then, with the new phones, I decided to try and get with the modern era and use my calendar on my phone. This has been an interesting experience and one that has left me confused and not able to keep appointments. What is wrong with me?! Does this resonate with anyone? Maybe it’s just age and/or memory. For this reason, I have decided to go back to the old ways of carrying around a diary at all times in case I need to make a new appointment that could change my life. On looking for a diary, I met Elena Sepulveda at the Yoga Show at London Olympia 2012. We had a stand opposite each other and there were such beautiful diaries. So I am now hooked. Hopefully, I will now remember everything. Maybe. Yogagenda is a beautiful diary designed and created by Elena Sepulveda from Barcelona. She brings together her love for yoga and her passion for publishing. 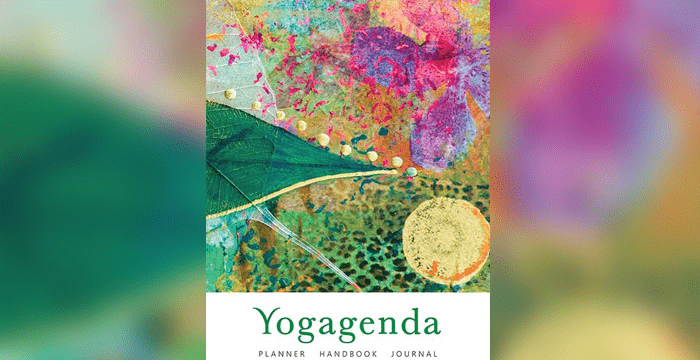 Yogagenda brings together introspection and daily life routines in this unique publication which is at the same time a yearly planner, a yoga handbook and a journal. Its calendars allow you to plan your days while drawing on inspiration from its yoga writings and beautiful artwork; its journal pages provide further space for notes, drawing, journaling… Carefully organised and printed to high environmental standards, this is a valuable tool to help you manage that precious resource: Time. – Monthly calendars with notes space. – Spacious weekly calendar pages. – Info on moon phases, solstices and equinoxes, eclipses. – A chapter of Patanjali’s Yoga Sutras in Sanskrit. – In-depth articles about different aspects of yoga. – Yoga festivals and celebrations around the world. – One great asana sequence. – Sanskrit Glossary and Asana Index for quick reference. – Blank pages for notes, journaling, drawing or whatever takes your fancy. It is a beautiful planner with a lot of time and love that has been put into it from Elena herself and the many contributors. It will become your new best friend!